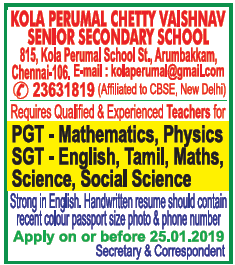 Kola Perumal Chetty Vaishnav Sr Sec School, Chennai has advertised in THE HINDU newspaper for recruitment of Teachers PGT / SGT jobs vacancies. Interested and eligible job aspirants are requested to apply on or before 25th January 2019. Check out further more details below. About School: Realizing the difficulties of the tiny tots to reach the school, Shri Kola Perumal Chetty donated a school bus in 1974. Science and Library Block was constructed in 1977 to accommodate the laboratories, workshops and library. The top floor of the main building was built in 1979. To facilitate the smooth functioning of the school activities, an Open Air Theatre was commissioned in 1982. The office functioning in the first floor of the new administrative block built in 1984 was shifted to the ground floor in 2004 together with the Principal’s office and the Correspondent’s room. The Principal’s room on the first floor was converted to the Committee Members’ room. Chennai – 600106, TN, India.